Combine all the ingredients (except the chicken) in a large bowl and mix well to form the marinade. Toss in the chicken wings and mix well to coat then leave to marinade at room temperature for an hour, or in the fridge for 2 hours, or overnight. Preheat the oven to 200°C (425°F), on the grill setting. Spread the chicken wings out on a large baking tray and grill for 15-20 minutes, turning them halfway. If the wings should be golden and slightly charred, but if they start to colour too much, turn the oven down to 200°C (392°F). 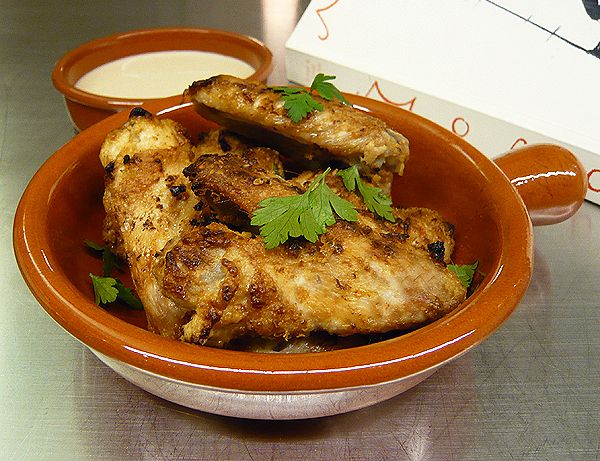 Serve hot or at room temperature with the tahini sauce, garlic yogurt and lemon wedges. Combine all sauce ingredients and season with salt and pepper to taste. Serve at room temperature. Combine all ingredients and mix well. Serve at room temperature. ~ by gourmettraveller on February 5, 2010. I never thought to used tahini in a marinade. Looks good, Tahini is a thing we always have in the pantry it enters in a lot of Lebanese things. Definitely a must try. I love the presentation in the clay pan. I made my own tahini recently. Am intrigued at using it for chicken, will try this recipe soon. I’ve never had garlic yogurt before, does it taste anything like french onion dip or is it completely different? No, it’s pretty different. It’s essentially yogurt with crushed garlic and olive oil so it’s quite mild but goes beautifully with grilled or barbecued meats. I would suggest a “tahina” sauce, basically the same as the tahini sauce with yogurt added giving the “mild cool” taste you are looking for. Actually, make both sauces, Tahini and garlic yogurt and then mix them together.